Juan C. (Tena) Uribe...married (Ana)…has four children: Juan Luis, Juanny, Janny and Johanny…is the nephew of former Giants infielder Jose Uribe…has greeted fans and signed autographs at the Viva Los Dodgers throughout his time with the club...organizes an annual holiday gift giveaway from his home in the Dominican for the children of his community...originally signed by the Rockies as a free agent on Jan. 15, 1997 and signed by Colorado scouts Rodolfo Rosario and Jorge de Posada. Had a bounce back season with the Dodgers in 2013, earning back the starting job at third base and batting .278 with 12 homers and 50 RBI in 132 games. Was the Dodgers' Wilson Defensive Player of the Year and ranked second among MLB third basemen with a .983 fielding percentage in 123 games (101 starts) at the hot corner...committed just five errors in 900.1 innings at third base ... made the first four appearances (one start) of his career at first base. Was especially good at home, batting .290 (56-for-193) in 70 games at Dodger Stadium Did most of his damage against right-handed pitching, posting a .290 batting average (85-for-293) with 37 of his 50 RBI coming against righties. Hit a career-high three home runs on Sept. 9, 2013 at home in an 8-1 victory over Arizona … also tied a career-high with four hits in the game. Homered in consecutive games on two different occasions on the season, the 19th and 20th times in his career, doing so on April 9 and 11 and July 3 and 5. Recorded a career-high tying seven RBI on July 5 in a 10-2 victory at San Francisco, going 3-for-5 and finishing a single shy of the cycle … also totaled seven RBI on June 19, 2004 in a 17-14 loss at Montreal. With two outs and runners in scoring position, he batted .324 (12-for-37) with two homers and 15 RBI. In 27 games against the NL East, he batted .344 (21-for-61). Finished the season strong and batted .286 (57-for-199) with seven homers and 22 RBI after the All-Star break... in 22 games in the month of September he batted .308 (24-for-78) with 12 extra-base hits and 13 RBI. Started each of the Dodgers' 10 postseason games at third base, batting .231 (9-for-39) with two homers and seven RBI in the NLDS and NLCS...hit .375 (6-for-16) with four runs scored, a double, two homers and four RBI in four games during the Division Series against Atlanta ... his two-run in the eighth inning was the game-winner in the Dodgers' come-from-behind 4-3 victory in Game 4 of the 2013 NLDS against Atlanta...was the second seriesclinching home run of his career along with his solo shot in Game 6 of the 2010 NLCS vs. Philadelphia ...did not commit an error in 90.1 total postseason innings in the field. Appeared in 66 games in his second season with Los Angeles. In the field, appeared in 46 games at third base and one at shortstop...committed just five errors, good for a .956 fielding pct. Hit .282 (11-for-39) with runners in scoring position and batted .273 (18-for-66) with runners on base. Went 3-for-15 (.200) with three walks and an RBI as a pinch-hitter this season. Tied a career high with four hits on April 23 against Atlanta (fifth time, last: Sept. 8, 2007, White Sox vs. Minnesota), going 4-for-4 with two runs scored and three RBI. Established season highs with four RBI and three runs scored on July 21 at New York-NLWas involved in the Dodgers' 14th triple play in team history on April 15 versus San Diego, forcing the first out at third base. Missed 27 games on the disabled list with a left wrist injury from May 14-June 11. Committed just three errors in 621.1 innings in 74 games in the field...led National League third baseman (min. 450 innings) with a .978 fielding percentage (3 E/136 TC)...Did not commit an error in 18 games (17 starts) at second base and also had a 1.000 fielding percentage in four games (three starts at shortstop)...Hit .435 (10-for-23) with two homers and nine RBI during his season-long six-game hitting streak from April 17-22..Knocked in four runs on April 20 vs. Atlanta and April 22 at Chicago...Homered in consecutive games for the 18th time in his career, doing so on April 21 and 22...Ejected by umpire Mike DiMuro on May 9 at Pittsburgh after disputing a call on a fly ball...was the first ejection of his career...Missed a total of 75 games on the disabled list to due to a left hip flexor muscle strain (14 games, May 21- June 6) and a left hip strain (61 games, July 24-conclusion of the season)...underwent season-ending sports hernia surgery on Sept. 7. Batted .248 (129-for-521) with 64 runs, 24 doubles and a career-high 24 homers and 85 RBI in 148games during his second season with San Francisco ...Ranked second on the team in home runs and RBI, third in games and slugging pct. (.440), fourth inhits and on-base pct. (.310) ...His 19 homers as a shortstop were the most by a Giant since Rich Aurilia had 37 in 2001 ...Started 139 games, his most starts in a single season since 2007 with the White Sox (147)...started22 games at second base, 96 games at shortstop (.984) and 21 games at third base (.957) ...11 of his 24 home runs either tied or gave the Giants the lead (seven go-ahead and four game-tying) ...On Sept. 4 at Los Angeles, hit a go-ahead two-run shot off Jonathan Broxton, which turned 4-3 deficitinto a 5-4 Giants victory ...Hit .309 (21-for-68) through his first 21 games of the season ... Recorded his first walk-off hit (seventh of his career) and RBI of the season on Aug. 14 at San Diego ...Homered twice on Sept. 23 at Chicago in the Giants' nine-run second inning...became only the third shortstop in Major Leaguehistory to hit two home runs in one inning (first NL shortstop)...was the first Giant to hit pair of homers in one inning with oneof those homers being a grand slam since Willie McCovey accomplished the feat on June 27, 1977 at Cincinnati (sixth inning)(Elias)...his six RBI in second inning were most by Giants player in one frame since Jim Ray Hart had six in the fifth inning on July 8,1970 at Atlanta...also became the seventh player in the last 30 years to hit two homers in an inning and drive in at least six runs...last NL player to do this was Juan Rivera in 2004 with Expos ...Was second on the Giants with nine postseason RBI...five of those RBI came in the World Series...had the game-winning sacrificefly in Game 5 of the NLCS vs. Philadelphia and followed that up with a solo home run in Game 6 that snapped a 2-2 tie andpropelled San Francisco to its first pennant since 2002. Hit .247 (80-for-324) with 22 2Bs, 7 HRs and 40 RBI in 110 games in his 5thseason with White Sox...played in 40 less games than 2007 with 13 fewer HRs and 28 less RBI...struck out just 64 times, compared to 112 in 2007...his .296 on-base pct. was highest since 2005(.301)...appeared in 57 games at 3B, 52 at 2B and 4 at SS...was only American Leaguer to play inat least 50 games at 3B and 2B...compiled .960 fielding pct. (7er, 17tc) at 3B and .996 (17er, 705tc)at 2B...started final 25 games at 3B following Joe Crede being placed on Disabled List Sept. 3...batted .271 (48-for-177) in 2nd half, up from .218 (32-for-147) prior to All-Star Break...finished1st on Sox in sacrifice hits with 5...drove in 14 runs in 23 games vs. AL West opponents...madehis 4th consecutive Opening Day start with Sox and 1st at 2B base (previous 3 at SS)...batted .164in April, tied for 3rd-lowest in AL...homered April 28 vs. Baltimore, ending 61 at-bat homerlessstreak...left May 15th game at Angels with slight right hamstring strain...was placed on 15-dayDL May 23 (retro to May 16) with strained right hamstring...was reinstated from DL May 31...went 1-for-3 with 2 RBI and scored winning run June 13 vs. Colorado, his 1st start since May 15...started at 3B July 13 at Texas (3-for-5, 3B, RBI) for 1st time since Sept. 26, 2004 vs. Kansas City...hit .310 (13-for-42) combined in June and July...homered Aug. 14 vs. Kansas City, 1 of record-tying4 consecutive HRs in 6th inning (also Jim Thome, Paul Konerko and Alexei Ramirez)...clout ended107 at-bat homerless streak...started 22 consecutive games at 3B Aug.1-24 (.256, 22-for-86)...collected7th career multi-HR game Sept. 5 vs. Angels. Batted .234 (120-513) with 18 doubles, 20 home runs and 68 RBI in 150games in his fourth season with the White Sox ... ranks second among AmericanLeague shortstops since 2005 with a .976 fielding percentage, third with 57 homeruns and sixth with 210 RBI ... recorded his second straight 20-homer season(third overall) and finished second among AL shortstops in homers, one behindCleveland's Jhonny Peralta (21) ... his 34 walks and 112 strikeouts were up fromhis 2006 totals (13 and 82) ... fell five games short of matching his career best(155 in 2002) ... made 147 starts at shortstop, an increase from 127 in 2006 ...was second among American League shortstops with a .976 fielding percentage(17 E/705 TC) ... led the club with seven sacrifice hits and ranked second withfive sacrifice flies ... hit .257 (36-140) with seven home runs vs. left-handers and.225 (84-373) with 13 home runs vs. righties ... 11 of his 20 homers were solohosts, 15 came at U.S. Cellular Field and 12 came after the All-Star Break ...batted .198 (23-116) with runners in scoring position (.287 in 2006) ... wassuccessful in only one of 10 stolen base attempts ... reached on error nine times,tied for sixth-most in the AL ... recorded seven home runs from the No. 9 positionin the lineup, second-most in the AL behind Detroit's Brandon Inge (nine) ... his.180 average in July was the seventh-lowest in the AL ... batted .200 (12-60)during interleague play ... hit .282 with 14 homers and 41 RBI vs. AL Central foes(.194 against rest of baseball) ... totaled six homers and 14 RBI vs. Kansas City... made his fourth Opening Day roster with the White Sox ... homered in backto-back games on 4/7-8 vs. Minnesota ... tallied nine RBI in his first nine games... missed three games from 5/4-6 and two contests on 5/20-21 after his motherfell ill ... hit safely in nine straight games from 6/24-7/3 (.387, 12-31) ... went 6-53 (.113) in 15 games following the hit streak from 7/4-21 ... hit his third careergrand slam on 8/3 at Detroit ... fell a double shy of the cycle on 8/8 vs. Cleveland,including a two-run, game-ending homer in the 13th inning ... hit his 100th careerhome run on 9/7 vs. Minnesota (off Carlos Silva) .. matched his career high withfour hits on 9/8 vs. Minnesota (fourth time), going 4-5 with two doubles ...recorded his sixth career multihomer game on 9/11 vs. Cleveland ... tallied thegame-ending RBI on 9/28 vs. Detroit, a single off Fernando Rodney ... amasseda season-best 10-game hitting streak from 9/19-29 (.333, 12-36) ... hit amonthly-best .309 (30-97) in September, second-highest on the club behindJerry Owens (.340). Hit .235 (109-463) with 21 home runs and 71 RBI in 132 games in his thirdseason with the White Sox ... is one of five shortstops in the major leagues to drivein 70 or more runs in each of the last three seasons, joining Derek Jeter, EdgarRenteria, Miguel Tejada and Michael Young ... his 28 doubles, 21 home runs and.441 slugging percentage were increases from 2005, but his average dropped .017from his .252 mark ... led the Sox with nine sacrifice hits and tied for second withseven sacrifice flies ... made 127 starts at shortstop, down from 143 in 2005, andcompiled a .977 (14 E/604 TC) fielding percentage, fourth-best among AL shortstops... drove in 46 runs before the All-Star Break and 25 in the second-half ... 17of his 21 home runs came off right-handers, and 11 came vs. the AL Central division... hit .287 (31-108) with runners in scoring position and .320 (16-50) with RISP andtwo outs ... attempted just two stolen bases (1-2) ... homered in consecutive gamestwice ... hit .167 (11-66) in April ... missed four games from 4/13-16 with a sore leftside ... recorded his fifth career multihomer game on 4/23 vs. Minnesota ... hit agame-ending single on 5/3 vs. Seattle in the 11th inning, scoring Pablo Ozuna ...was hit in the head with a pitch by Oakland's Dan Haren on 5/24 ... was 25-70 (.357) with seven home runs and 28RBI in 18 games from 6/15-7/4 ... drove in 14 runs in five games from 6/30-7/4 ... went 3-4 with a double, home runand five RBI on 7/2 at the Cubs ... also totaled five RBI on 7/4 vs. Baltimore ... hit .308 (24-78) with 20 RBI in June... the 20 RBI were his most-ever recorded in a month ... compiled an 11-game hitting streak from 7/16-29 (.375,15-40) ... missed six games from 8/6-11 with a stiff lower back ... ended an 0-21 slump with a home run on 9/8 vs.Cleveland ... hit his second career grand slam on 9/24 vs. Seattle ... hit three home runs and picked up nine RBIin his last nine games ... did not draw a walk in his final 27 contests (95 at-bats). Spent the entire season at shortstop after appearing at second base, shortstop and third base with the White Sox in 2004 ... ranked third among American League shortstops with a .977 fielding percentage, fourth with 71 RBI and fifth with 16 home runs ... drove in 71 runs after collecting a career-high 74 in 2004 ... tied for second in the AL with 10 sacrifice flies and matched his career high with 11 sacrifice bunts (also 2004) ... tied for third on the Sox in RBI with Tadahito Iguchi ... his 40 RBI from the No. 9 position in the order tied with Texas' Rod Barajas for the most in the AL ... posted a .300 (27-90) average in 26 games when hitting eighth ... batted .311 (38-122) vs. left-handers and .231 (83-359) vs. right-handers ... 11 of his homers came off righties ... hit .270 (70-263) on the road and .234 (51-218) at home ... went 27-106 (.255) with runners in scoring position after hitting .323 (32-99) in 2004 ... made 143 starts at shortstop and compiled a .977 (16 E/687 TC) fielding percentage, third-best among AL shortstops ... hit a season-low .225 in May ... hit .304 (28-92) with seven home runs and 16 RBI in September ... tied for the team lead with 10 three-hit games and posted 29 multihit games overall ... combined to hit .347 (33-95) with six home runs and 24 RBI vs. Detroit and Kansas City ... hit safely in a season-high seven games on three occasions ... hit a game-ending sacrifice fly on 4/6 vs. Cleveland, his third game-ending plate appearance with the Sox ... drove in the winning run with a sacrifice fly in the 10th inning on 4/13 at Cleveland ... posted back-to-back three-hit games on 4/22-23 ... did not play from 4/27-5/2 due to a strained right groin suffered on 4/26 at Oakland ... homered in consecutive games on 5/8-9 (fourth time) ... walked home the winning run in the eighth inning on 5/5 vs. Kansas City ... hit his 50th career home run on 5/8 at Toronto, but committed two errors ... snapped a 0-21 streak with a double on 5/25 vs. the Angels ...did not play from 6/19-7/3 with a sore back ... ended a season-long 0-23 streak with a homer on 7/18 vs. Detroit ... tripled and scored the winning run in the 10th inning on 8/10 at New York ...hit .382 (26-86) with eight doubles, six home runs and 14 RBI from 8/31-9/20 ... played for Escogido in the Dominican Winter League, hitting .321 (9-28) with two home runs and six RBI in eight games ... Batted .286 (12-42) with five doubles, one home run and six RBI in 12 games for the World Champion White Sox ... reached base safely in 11 of the 12 games ... recorded the final two outs of the World Series, including a diving catch into the left field stands for the second out in the ninth inning of Game 4 ... went 2-4 with two doubles, an RBI and a stolen base in Game 2 of the World Series ... doubled to lead off the seventh inning and scored on Paul Konerko's game-winning grand slam ... hit .400 (4-10) with a double, home run and four RBI in the ALDS vs. Boston ... went 2-4 with a home run and three RBI in Game 1 of the ALDS ... executed a suicide squeeze in the ninth inning of Game 3 of the ALDS at Fenway Park, scoring A.J. Pierzynski to give the Sox a 5-3 lead. Batted .283 (142-502) with 23 home runs and 74 RBI in 134 games in his first season with the White Sox... set career highs in virtually all offensive categories ... ranked among the American League leaders in averagewith bases loaded (T6th, .556), sacrifice hits (T8th, 11) and average with runners in scoring position (10th, .340) ...finished third on the club in doubles (31) and RBI and fourth in hits and runs scored ... hit .355 (44-124) with sevenhome runs and 26 RBI over his final 32 games ... made 70 starts at second base (.984 fielding percentage), 32 atshortstop (.983) and 19 at third (.965) ... his .983 (3 E/172 TC) fielding percentage at shortstop would have rankedsecond in the AL with the required chances ... led off 22 times (Sox were 10-12), hit second 62 times (34-28), fifththree times (2-1), sixth 10 times (6-4), seventh 10 times (5-5) and eighth 14 times (8-6) ... hit .289 (28-97) from theNo. 1 spot in the order and .285 (74-260) from the No. 2 slot ... batted .306 (37-121) at shortstop, .277 (81-292) atsecond base and .256 (21-82) at third ... batted .315 with 16 home runs at home compared to .248 and seven homeruns on the road ... hit .293 (95-324) vs. right-handers and .264 (47-178) vs. lefties ... hit 12 home runs off lefties,tied for the fifth-most in the AL ... 14 homers came vs. AL Central opponents ... collected 11 infield hits ... Sox went43-17 when he scored a run and 31-12 when he drove in a run ... led the Sox with 15 three-hit games and posted41 multihit games overall ... was successful on 45.0 (9-20) percent of stolen base attempts, the lowest percentagein the AL ... his .393 (24-61) average in April was the highest by a Sox hitter since 1972 ... average was above .300every day between 4/14-6/24 ... hit .407 (35-86) in 22 games from 4/13-5/7 ... became the seventh Sox player since1999 whose first Sox hit was a home run on 4/13 vs. Kansas City ... drew a game-ending walk on 4/25 vs. TampaBay ... drove in a career-high seven runs on 6/19 at Montreal, one shy of the club record ... recorded multihomergames on 5/27 vs. Texas and 6/8 vs. Philadelphia ... participated in a triple play on 7/7 vs. Anaheim (5-4-3) and hitthe game-ending single ... hit first career grand slam on 9/21 vs. Minnesota off Jesse Crain ... homered in backto-back games on 8/6-7 vs. Cleveland and 9/29 at Detroit and 9/30 at Kansas City ... compiled a pair of nine-gamehitting streaks, most recently to end the season (.432, 14-34) ... made 35 straight starts from 5/16-6/25 ... playedin 10 games for Escogido in the Dominican Winter League ... agreed to terms on a three-year, $9.75 million contractwith a club option for 2008 on 12/16. Was limited by injuries to 87 games with Colorado ... opened the season on the 60-day disabled list with a fracture of the fifth metatarsal of the right foot and missed the Rockies first 58 games ... suffered the injury running the bases during a spring training game on 3/1 ... underwent surgery to repair the fracture on 3/5 in a procedure performed by Dr. Thomas Noonan and Dr. Douglas Wyland in Englewood, Colo. ... began his rehabilitation assignment on 5/27, combining to hit .345 (10-29) with a home run and seven RBI in two games at Class A Visalia and five at Class AA Tulsa before being reinstated on 6/3 ... made his Rockies season debut that night vs. Cleveland, going 2-5 with two home runs and four RBI ... it was his second career multihomer game (first on 10/7/01 at San Diego) ... hit safely in 11 of first 12 games, including a 10-game hitting streak from 6/5-15 (.333, 15-45) ... batted .304 (25-83) vs. left-handers ... played in 74 games at shortstop, 11 at second base and one in the outfield, compiling a .974 fielding percentage (12 E/466 TC) ... posted a .972 fielding percentage at shortstop (11 E/396 TC) and did not commit an error in 75 chances in September ... scored a career-high four runs and tied his career high with four hits (4-6) on 8/3 at Pittsburgh ... made his first career start in the outfield (center) on 6/15 at Detroit ... played in 21 games for Escogido in the Dominican Winter League, hitting .275 (19-69). Started 150 games at shortstop for Colorado in his first full season in the major leagues ... batted .373 (38-102) in April but hit just .211 (98-464) over his final 129 games ... led all major-league shortstops with 766 putouts,793 total chances and 119 double plays and was second with an average of 3.45 assists per nine innings ... compileda career-high 17-game hitting streak from 4/16-5/5, six short of the Rockies franchise record ... batted .368 (25-68)during the streak, which tied Larry Walker for the club season high ... rebounded to hit .314 (22-70) in September... made his first career Opening Day start ... ranked third on the team with 38 multihit games ... struck out 120 times,the fourth-highest total in franchise history ... tied his career high with four hits on 9/13 vs. Los Angeles, missing thecycle by a home run. Appeared in 72 games over three stints with the Rockies in his first major-league season, batting .300 with eight home runs and 53 RBI ... ranked second in the National League and third in the majors with 11 triples, tying the club record shared by Neifi Perez (1999 and 2000) and Juan Pierre (also 2001) ... averaged one triple every24.8 at-bats ... his .300 average was second among NL rookies behind St. Louis' Albert Pujols (.329) and third inslugging percentage (.524) ... despite playing less than half the season, also ranked fourth among NL rookie leadersin RBI, extra-base hits (34), total bases (143) and multihit games (25) ... was recalled from Class AAA ColoradoSprings on 4/8 and made his major-league debut the same day vs. San Diego as a pinch-hitter, going 0-1 ... at ageyears, eight months and 17 days, was the youngest player to make his debut with the Rockies ... made first starton 4/9 at St. Louis, going 0-4 ... collected first career hit on 4/11 at St. Louis, a single off Matt Morris ... was optionedto Colorado Springs on 4/23 ... was recalled again on 5/19, optioned a second time on 5/23 and recalled for the finaltime on 7/25 when Neifi Perez was traded to Kansas City ... started 59 of the Rockies final 61 games at shortstop... compiled a .983 fielding percentage ... went 4-4 with a triple and three RBI on 9/24 vs. San Diego ... hit five triplesin 10 games from 9/18-28 ... recorded first career multihomer game in the seasonbs final game on 10/7 at San Diego,going 3-5 with a double, five RBI, three runs scored and 10 total bases ... homered and doubled in the second inningto tie three franchise records for an inning: most hits (two), most extra-base hits (two) and most total bases (six). Established career bests in hits (124), home runs (13), RBI (65), runs scored (64), triples (7) and stolen bases (22) at Class A Salem in the Carolina League ... ranked third in the CL in triples and games played ... was second on the club in home runs ... batted .448 (30-67) with 17 RBI over a 16-game stretch from 6/6-24 ... hit a grand slam and drove in five runs on 8/24 vs. Frederick. Spent the season at Class A Asheville in the South Atlantic League, hitting a career-high 28 doubles ... compiled a 15-game hitting streak from 6/24-7/14, going 22-5batted .392 (38-97) from the leadoff slot ... hit a grand slam on 5/4 vs. Columbus. Played in 40 games on the Rockies Arizona Rookie League championship team. Made his pro debut playing for the Rockies entry in the Dominican Summer League ... was signed by Rodolfo Rosario and Jorge de Posada. August 5, 2016 Cleveland Indians released 3B Juan Uribe. August 1, 2016 Cleveland Indians designated 3B Juan Uribe for assignment. February 28, 2016 Cleveland Indians signed free agent 3B Juan Uribe. 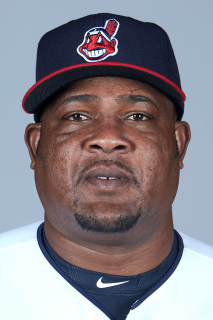 November 2, 2015 3B Juan Uribe elected free agency. October 27, 2015 New York Mets activated 3B Juan Uribe. October 9, 2015 New York Mets reassigned 3B Juan Uribe to the minor leagues. July 25, 2015 New York Mets activated 3B Juan Uribe. May 27, 2015 Atlanta Braves activated 3B Juan Uribe. August 31, 2014 Los Angeles Dodgers activated 3B Juan Uribe from the 15-day disabled list. June 26, 2014 Los Angeles Dodgers activated 3B Juan Uribe from the 15-day disabled list. June 19, 2014 Los Angeles Dodgers sent 3B Juan Uribe on a rehab assignment to Rancho Cucamonga Quakes. May 21, 2014 Los Angeles Dodgers placed 3B Juan Uribe on the 15-day disabled list. Right hamstring strain. December 24, 2013 Los Angeles Dodgers signed free agent 3B Juan Uribe. June 11, 2012 Los Angeles Dodgers activated 3B Juan Uribe from the 15-day disabled list. May 14, 2012 Los Angeles Dodgers placed 3B Juan Uribe on the 15-day disabled list. Left wrist injury. September 30, 2011 Los Angeles Dodgers activated 3B Juan Uribe from the 15-day disabled list. July 30, 2011 Los Angeles Dodgers placed 3B Juan Uribe on the 15-day disabled list retroactive to July 24, 2011. Lower abdomen strain. July 24, 2011 Juan Uribe roster status changed by Los Angeles Dodgers. June 6, 2011 Los Angeles Dodgers activated 3B Juan Uribe from the 15-day disabled list. June 2, 2011 sent 3B Juan Uribe on a rehab assignment to Rancho Cucamonga Quakes. November 30, 2010 Los Angeles Dodgers signed free agent 2B Juan Uribe. November 7, 2010 SS Juan Uribe elected free agency. January 5, 2010 San Francisco Giants signed free agent SS Juan Uribe. November 5, 2009 3B Juan Uribe elected free agency. May 22, 2009 San Francisco Giants activated 3B Juan Uribe from the bereavement list. May 17, 2009 San Francisco Giants placed 2B Juan Uribe on the bereavement list.